WAWA, PA and ATLANTA, GA--(Marketwired - Oct 5, 2015) - Wawa, Inc. and Citi Retail Services today announced the launch of the Wawa Credit Card, featuring savings for fuel purchases at Wawa stores. The Wawa Credit Card will give Wawa customers a convenient payment option with an enhanced value proposition on fuel purchases. 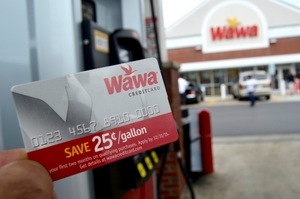 When customers use the Wawa Credit Card to re-fuel at Wawa stores, they will save 5¢ per gallon, up to 100 gallons per month. The 5¢ per gallon savings will be applied as a statement credit at the end of the month to Wawa credit cardholders' statements. To drive excitement during the program launch, from now through the conclusion of 2015 customers can save 25¢ per gallon, up to 100 gallons per month, for the first two months their account is open. "At Wawa, we are always looking for ways to simplify the lives of our customers and improve their experience with us. This new card is a way for us to provide a new level of value and convenience to our customers who rely on us for their fuel purchases. The card can also be used inside Wawa stores for all food, beverage and merchandise purchases," said Brian Schaller, Wawa's V.P. of Fuel. "In addition to our everyday competitive pricing, our new Wawa Credit Card will fuel savings and reward our loyal customers for their fuel purchases at Wawa." "Wawa customers now have even more reasons to be fans of this brand," said Craig Vallorano, Managing Director for Business Development and Strategy for Citi Retail Services, one of the largest and most experienced retail credit solutions providers. "The card rounds out the unique Wawa experience, and we're happy to be a part of that." Applications for the card are available in all Wawa stores, and customers can also apply by visiting WawaCreditCard.com, or by calling 1-800-251-6781. 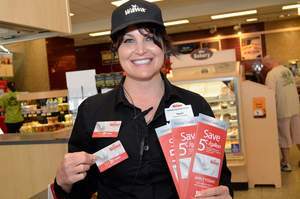 "We're thrilled to launch our new credit card, and plan to share our excitement by incorporating a celebration of its value into our upcoming new store opening celebrations by adding additional surprises to compliment the added savings during the card launch period," said Chris Gheysens, Wawa's President and CEO. "We look forward to providing our customers with more savings with our Wawa Credit Card." Wawa, Inc., is a privately held company headquartered in Wawa, PA, near Philadelphia. Wawa is your all day, every day stop for fresh, built-to-order® foods, beverages, coffee, fuel services, and surcharge-free ATMs. In July of 2015, Wawa was named "America's Most Beloved Convenience Store" by a Market Force study of 7,000 consumers winning with the highest "composite loyalty score" of 68 percent, and first place in the fresh food category. A chain of more than 700 convenience retail stores (over 450 offering fuel), Wawa stores are located in Pennsylvania, New Jersey, Delaware, Maryland, Virginia and Florida. The stores offer a large fresh foodservice selection, including Wawa brands such as built-to-order hoagies, freshly-brewed coffee, hot breakfast sandwiches, built-to-order specialty beverages and an assortment of soups, sides and snacks. Customers can save 25¢ per gallon, up to 100 gallons per month, for the first two months their account is open.